MIT has developed “duoskin temporary tattoos” that function as on-skin interfaces to mobile devices. Metallic-looking temporary tats are a fashion trend, and MIT’s Media Lab is not one to let a good trend go un-geekified. "It's just not a good time for me..." Most people ignore popup security warnings from their antimalware programs because the alerts pop up at the most inconvenient times, researchers at Brigham Young University report. The finding has potential to improve users’ response rates to warnings simply by timing them properly. A spoonful of sugar helps the medicine go down. But will that work when you need to swallow a battery? A team at Carnegie Mellon University is working on non-toxic, edible batteries with the goal of providing power for ingestible medical devices that can be used to diagnose or treat diseases. The FCC’s push to override state laws that restrict municipal broadband networks was dealt a severe setback by a three-judge appeals panel’s ruling that the agency overstepped its authority in attempting to preempt state laws. The FCC could take the matter to the Supreme Court, or ask the full appeals court to hear its case. But it’s not looking good for municipal networks. On the bright side, perhaps the 10th Amendment to the U.S. Constitution is not completely shredded. The keyless remotes that lock and unlock 100 million Volkswagen vehicles are vulnerable to hackers, security researchers have demonstrated. There’s no reason to believe that other carmakers’ remotes are any more secure. "Take a letter, Maria." My Text In Your Handwriting is an algorithm that can scan a sample of the worst handwriting and replicate it to a credible degree. Developed by a team at the University College London, the program fooled human judges 40 percent of the time. Google has launched Duo, a one-to-one VoIP and videoconferencing app that does not require a Google account to use. Unfortunately, no desktop version is planned, only Android and iOS versions. What weighs 25 pounds and costs $41 to mail less than ten miles? One company’s monthly bank statement, thanks to the combination of an antiquated Dept. of Motor Vehicles policy and Silicon Valley Bank’s refusal to provide paperless statements to businesses. File this under "What Could Possibly Go Wrong?" -- Driverless buses are being tested on the streets of Helsinki, Finland, mainly because Finnish law does not require motor vehicles to have human drivers. Most recent comments on "Geekly Update - 24 August 2016"
"Robots have been dealt a serious blow..."
Not really. The revolt has begun. Roomba is just showing it won't take any excretion from anyone. The last item in today's list is one that worries me for the future, as robotics are entering a field where humans are going to get replaced. Again. I get that we can't be against progress just to be "against" something, but if those drivers (be it for buses, cabs or the transport industry) are let go and replaced like, how are they going to earn a living? I don't think it possible to retrain everybody that's going to be affected by such a disruptive change, and to do what? This is looking bleak to say the least. It's akin to doing something because they can, and not stopping to reflect on whether they should. It's a fight between ethics and money, and for the last few decades, money seems to win, and always in the favour of a select few. As IBM likes to say, "Machines should work. People should think." Machines have been replacing people ever since someone invented the first machine. Note that I do not have a secretary to type this comment. As machines do more and more work, Universal Basic Income looks better and better. A common reason to ignore security messages is when they are fraudulent as often seen on web pages. I've even seen them on my phone ... "3 virus detected! 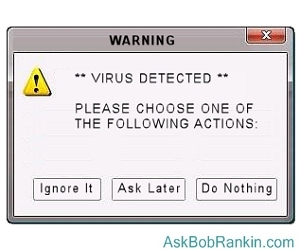 Click here to clean." How's the poor user to know what's right and what's wrong? Indeed, they don't want to, they just want the *&^$! thing to work. I can smell a phish from 10 feet away (metaphorically) but that's a skill developed by working with computers over 45 years. BobR: In fact, that would be a good article - how can a normal (not geeky) person know the difference between 'good' and 'bad' computer warnings? I always pay attention to popup security messages, if it is from my anti-virus program, any others, I laugh and think, good try. About the Robots taking over, just remember Westworld! I wonder what will happen to rider confidence when the system announcement gets stuck and says, "This bus is driven by a robot by a robot by a robot by a robot by a robot . . . ."